M40 north to join M42 then M6 north. Exit the M6 at junction 43 and take the first exit at the roundabout signposted for Carlisle City Centre. Follow the road through two sets of traffic lights and the ground is on the right hand side. Parking is available around Brunton Park and there is a large carpark situated behind the away end. Check www.rac.co.uk for specific or more detailed directions. Train: Nearest station Carlisle just over 1 mile from the ground. Train connections from High Wycombe via London Euston. Return journies on same day following evening kick-offs are not possible. Check www.nationrail.co.uk for specific times and connections of trains. 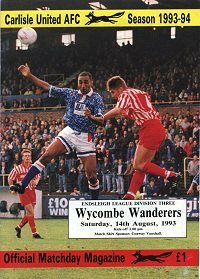 Wanderers' first ever game in the Football League was against Carlisle United on Saturday 14th August 1993. The game ended 2-2 with Wycombe's first ever goal coming via Carlisle's Chris Curran. Steve Guppy was to score Wycombe's second goal by conventional means but Curran equalised at the other end to deny Martin O'Neill's side victory. Later the same season, Wanderers beat United over two legs in the Division Three Play-Off Semi-Final to reach the Final against Preston North End. Archie Gomm - Centre-half who made 29 First Team appearances for Wanderers during the the 1918/19 and 1919/20 seasons before turning professional with Millwall in 1920. The popular player made 187 League appearances over a ten year spell for The Lions. Spent the later part of his football career with United - adding a further 67 League appearances to his record during the 1931/32 and 1932/33 seasons. John Deakin - Former Barnsley apprentice but made his Football League debut with Doncaster Rovers in the mid 1980's. The midfielder dropped down to non-League football where he played for Frickley Athltic before being signed by then Shepshed Charterhouse Manager Martin O'Neill. Within seven weeks at Shepshed he had been sold to Birmingham City for £10,000. 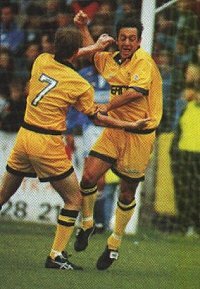 Left Birmingham after two years and made three League appearances for Carlisle in 1991 before Martin O'Neill, now Wycombe Manager, brought him to Adams Park for the 1991/92 season. Made 23 First Team apps before his release at the end of the 1991/92 season. Went on to have a long spell at Kidderminster Harriers where he won a Conference winners medal. Stuart Green - . Midfielder who made 19 League appearances for Carlisle during the 2001/2 season while on loan from Newcastle United where he was a trainee. Later switched to Hull City under Peter Taylor before a return to Brunton Park at the end of the 2002/3 season on another loan spell. Went on to have time with Crystal Palace and Blackpool before Peter Taylor (now Wycombe Manager) brought him to Adams Park in the summer of 2009. Mo Harkin - Former Wycombe Youth Teamer who made his senior debut in December 1996 aged 17 and went on to make 92 appearances in a Wycombe shirt during a five year spell. The highly rated midfielder gained Northern Ireland U21 honours while at Adams Park and was linked with moves to Premier League sides before injury stiffled his career. Released by Lawrie Sanchez at the end of the 2000/1 season and made four League appearances for Carlisle at the start of following campaign but was released at the end of his one month contract. Spent time with Aldershot Town and Nuneaton Borough before signing for Crawley Town in the summer of 2002 where he spent three seasons. Later had extended spells with Havant & Waterlooville and Kingstonian. Tony Hemmings - Two year spell at Wycombe following Wanderers promotion to the Football League in 1993. Scored 12 League goals for Wycombe in 49 apps but was restricted through injury. Moved to Chester City via Macclesfield Town, Hednesford, Altrincham and Ilkeston in January 2000 - going on to make 19 apps and scoring twice. Later had spells at Carlisle United and a return to Ilkeston before time with Alfreton. Originally joined Wycombe from Northwich Victoria for a £25,000 fee. Richard Keough - Defender who made 3 League appearances for Wanderers in November 2005 on loan from Bristol City - scoring an own-goal on his debut versus Darlington. First played for Carlisle during a loan spell from City in the 2007/8 season before making the move permanent in August 2008. A popular player at Brunton Park during a two year spell where he made 88 First Team apps during their time in 'League One'. Later went on to play for Coventry City and Derby County in the 'Championship'. Alan Mayes - Former Queens Park Rangers trainee who went on to make more than 150 appearances for Watford before two spells at Swindon Town in the 1980's netting a total of 65 goals in 151 League games either side of a three year stint at Chelsea (66 apps - 19 goals). Spent the 1985/86 season with Carlisle, scoring twice in 10 League appearances. Also had a brief loan spell with Newport County during his time with United before a season with Blackpool. His time with Wycombe came during the 1987/88 season where he made ten Conference appearances after being signed by Peter Suddaby. Jordan Mustoe - Defender who made 14 loan appearances for Carlisle during the second-half of the 2012/13 season while on the books of Wigan Athletic. Had earlier spent time on loan at Barnet and Morecambe. Spent a month on loan at Bury in October 2013 and made three appearances for Wycombe on loan during the second-half of the 2013/14 season. Later had a further loan spell with Morecambe before a permanent move to Accrington Stanley in August 2014 - making four First Team appearances before being released from his short-term contract. Played for Belgium club Westerlo afte his brief spell with Accrington. Stephen O'Halloran - Left-sided defender who was given his professional debut by Paul Lambert at Wanderers during a loan spell from Aston Villa in the 2006/7 season - making 11 League appearances and playing in the League Cup Quarter-Final victory over Charlton Athletic and the Semi-Final 1st Leg draw with Chelsea at Adams Park. Recalled by Villa Manager Martin O'Neill before the 2nd Leg at Stamford Bridge. Never made a First Team appearance at Villa and eventually joined Coventry City for the 2010/11 season. Signed for Carlisle in the summer of 2011 but made just 5 League appearances before dropping into non-League football with Nuneaton Town and then Stockport County. Andy Robinson - Midfielder and former Manchester United apprentice who made close to 50 League appearances for Carlisle before being signed for Wanderers by Jim Kelman in August 1988. He had been recommended to Wycombe by former Carlisle goalkeeping team-mate Steve Crompton who had also joined Wycombe in the summer of 1988. Robinson. Robinson went on to make 139 First Team apps for Wanderers and featured heavily in the 1990/91 FA Trophy winning run under Martin O'Neill, although didn't play in the Final at Wembley against Kidderminster. Subsequently released at the end of that season and went on to spent three seasons with Aylesbury United. John Sutton - Former Spurs trainee who made 10 appearances for United on loan while still at White Hart Lane during the 2002/3 season. Moved to Scotland to play for Raith Rovers during the 2003/4 season but returned for a brief spell with Milwall later that season but failed to make an impact and returned north to play for Dundee (on loan) and then St Mirren. His goalscoring exploits north of the border led to Paul Lambert brining him to Adams Park in the summer of 2007 but after just six goals during his first season, was released to join Motherwell on a free. Martin Taylor - Goalkeeper who made 14 First Team appearances for United on loan from Derby County during the 1987/88 season. Eventually joined Wycombe in 1997 from County and went on to make close to 300 First Team appearances in a memorable spell with the Wanderers. Magno Veira - Scored 10 goals in 25 League appearances for United during their 2004/5 'exile' season in the Conference. A former Wigan Athletic trainee who spent time on loan at Northampton during 2003 but failed to make a First Team appearance. Joined Carlisle in the summer of 2004 and went on to play for Barnet before moving back into non-League football with Crawley Town in the summer of 2006. Signed for Wanderers from Crawley Town by Peter Taylor in the summer of 2008 and made 17 appearances (12 as substitute) before his release in May 2009. Subsequently played for Ebsfleet United in the Conference. John Gorman - The Wanderers Manager spent six years as a player at Brunton Park in the early 1970's making more than 200 First Team appearances. His time there coinceded with their solitary season in the top division of English football (1974-75) before his eventual transfer to Spurs in 1976. His managerial career at Wycombe began in November 2004, a year after a brief spell as caretaker. Read more on John Gorman's appointment at Wycombe.